The train movements were stopped between Ameerpet and Mettuguda for about an hour and the tracks were also thoroughly checked as a precautionary measure, said an official of Hyderabad Metro. Hyderabad: A metro train developed a technical problem leading to disruption of services for some time today morning. "A train had some technical problem at Ameerpet in the morning. 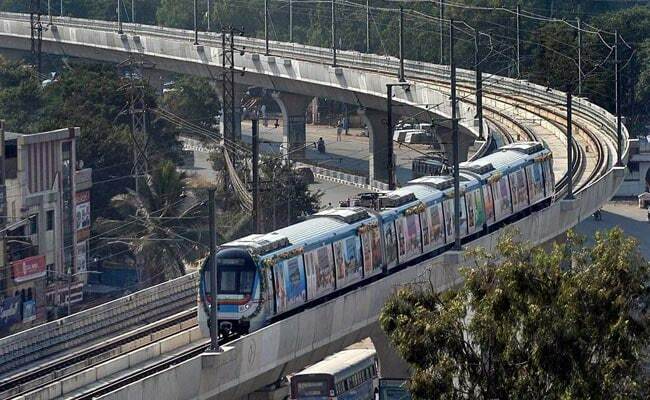 It was safely taken to the nearby Prakash Nagar station and parked there to give way to other trains coming from both directions," said an official of Hyderabad Metro. The train movements were stopped between Ameerpet and Mettuguda for about an hour and the tracks were also thoroughly checked as a precautionary measure, the official said. The services resumed later. The first phase of the Hyderabad Metro Rail project was inaugurated on November 28 on a 30 km stretch between Miyapur and Nagole.